JAKARTA, Indonesia – A U.S.-born male Sumatran rhino arrived in his ancestral home of Indonesia on Sunday, making the long journey from Cincinnati, Ohio, on a mission to mate to help save his critically endangered species from extinction. The eight-year-old rhino, Harapan, was born at Cincinnati’s zoo and spent nearly the past two years as the last Sumatran rhino in the Western Hemisphere. He arrived at Jakarta’s Soekarno-Hatta airport Sunday in a special travel crate aboard a Cathay Pacific jet. He continued his trip in a truck to the seaport of Merak and was to be ferried to Sumatra island. “Thankfully, it has arrived here,” said Bambang Dahono Adji, director of biodiversity conservation at Indonesia’s Ministry of Environment and Forestry. He said Harapan would be “officially handed over” to Indonesian authorities on Thursday at Way Kambas National Park, where the Sumatran Rhino Sanctuary is located. The 816-kilogram rhino underwent medical checks and was trained to walk into and voluntarily remain in his crate before beginning the more than 16,000-kilometre trip on Friday, ending a captive breeding program for the species at the Cincinnati Zoo that had produced three rhinos. Harapan was accompanied on his trip by a veteran Cincinnati Zoo animal keeper who was at the Sumatran Rhino Sanctuary when Harapan’s older brother became a father there in 2012. Conservationists hope Harapan can mate with one or more of the three females at Way Kambas, where Ratu, a 12-year-old female rhino born in the wild, is now pregnant with her second calf and is expected to give birth in May. Ratu’s first calf, a male named Andatu born in 2012, was the first Sumatran rhino born in an Asian breeding facility in more than 140 years. The father of both calves is Harapan’s brother Andalas, who was returned to Indonesia in 2007. Harapan and Andalas’ sister, Suci, died from illness last year at the Cincinnati Zoo, leaving Harapan as the last Sumatran rhino in the Western Hemisphere. Indonesia has said it does not want to be dependent on other countries in conservation efforts by sending rhinos to be bred abroad. However, it says it welcomes any technological or scientific assistance for the Sumatran rhino breeding program. 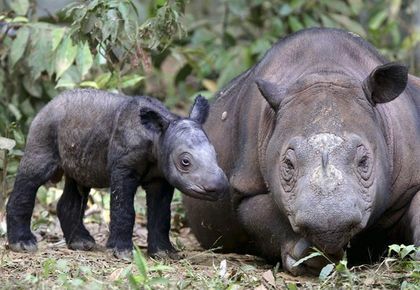 The Sumatran rhino is seriously threatened, with the species’ numbers in Indonesia over the past 50 years decimated by rampant poaching for horns used in traditional Chinese medicines and destruction of forests by farmers, illegal loggers and palm oil plantation companies.